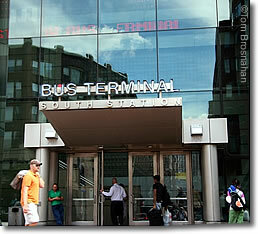 All Amtrak trains and some MBTA	Commuter Rail trains use Boston's South Station Transportation Center, as do most intercity buses. 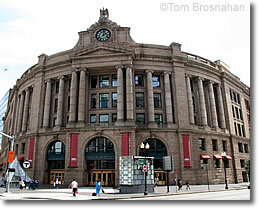 Boston's South Station Transportation Center (map) is the city's main transportaation hub, only a short walk from Boston's Seaport District, Chinatown, and Downtown Crossing. Historic South Station serves some MBTA Commuter Rail trains as well as Amtrak intercity trains to and from cities to the west and south of Boston (such as New York City). Other Commuter Rail trains arrive and depart from North Station, a 1.1-mile (1.8-km) walk or a short taxi ride north of South Station (map). To travel from South Station to North Station by subway, descend to the Red Line subway station following signs for trains to Alewife. Take the Red Line Alewife train to Downtown Crossing and change to an Orange Line train bound for Oak Grove. Get out at North Station, walk upstairs and into North Station. Above, South Station, Boston MA. Below, South Station Bus Terminal.